THE Himalayas are virtually under bombardment—of dams. They would have the highest dam density in the world, with over a thousand water reservoirs dotting the mountain range in India, Bhutan, Nepal and Pakistan, over the next few years. These projects would have serious ecological and social impacts and would spell disaster for the biodiversity of the region. All this for the much-sought-after hydroelectricity, officially dubbed cleaner and cheaper. To assess the socio-ecological impact of the dams on the Himalayan region and the Ganga, Indus and Brahmaputra river basins, two researchers, Maharaj Pandit of the Centre for Interdisciplinary Studies of Mountain and Hill Environment at Delhi University and R Edward Grubine of Kunming Institute of Botany in China, used Landsat satellite imagery and spatial analysis. They studied 132 of the 292 dams in the Indian Himalayas, that were proposed or were under construction by 2005. Even if these many dams are constructed, there would be a water reservoir in every 3,000 square kilometres in the region. This is 62 times the global average dam density. The study, published in Conservation Biology in December 2012, shows nearly 90 per cent of valleys and 25 per cent of dense forests in the Indian Himalayas would be affected. Over 54,117 hectares of forests would get submerged, while 114,361 hectares would be damaged by dam-related activities—nearly 170,000 hectares in total. Also, 88 per cent of the project sites fall in zones rich in plant, bird, fish and butterfly species. Researchers’ model shows by 2025 deforestation might make 22 flowering plants and 7 vertebrate types extinct. By 2100, 1,500 flowering plants and 274 vertebrate species would be extinct, according to conservative projections. Jay Bhatt and Maneesh Kumar, of the Centre for Interdisciplinary Studies of Mountain and Hill Environment, conducted another study with Pandit to assess the impact of dams on fish species in 16 rivers in the Himalayas and Teesta river in Sikkim. The study, published in PLoS ONE in September 2012, shows unprecedented regulation of rivers and tinkering done with the fish’s habitat due to the dams would be a devastating blow to freshwater discharge and could lead to the extinction of many types of fish. Over 300 fish species are found here. In Himachal Pradesh alone, 41 hydel projects are running, 76 new ones are under construction and three have been abandoned due to environmental issues, according to the state’s electricity board. Resistance against these unmindful developmental projects is building up. HNA cites several victories for grassroots movements—ski-village project in Kullu-Manali worth thousands of crores of rupees has been stalled, the SEZ at Gagret in Una has been abandoned, environment impact assessment (EIA) of Lafarge Cement at Alsindi and Grasim at Sunder Nagar have been challenged in court, Renuka dam is stalled and the case is pending with the National Green Tribunal. Environmental and social impact of hundreds of dams would be enormous and the number of affected people would run into hundreds of thousands, cautions Himanshu Thakkar, coordinator of South Asia Network on Dams, Rivers & People, a Delhi-based nonprofit that works on water-related issues. “No wonder dozens of dam projects are being dragged to courts for faulty EIAs and various other impacts.” He says corruption is behind this dam-building spree, that has caught the fancy of politicians, contractors and bureaucrats. Less destructive alternatives are not even considered. 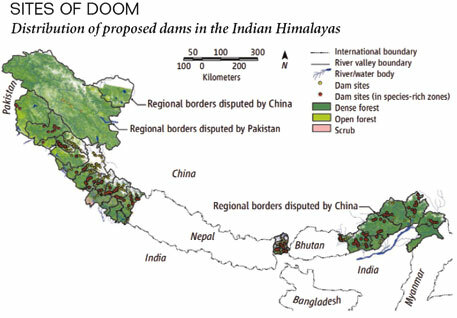 The Himalayan destruction highlighted by DowntoEarth supports my hypothesis: Dam the Rivers and Damn the Seas, which now needs to be rephrased Dam the Rivers Ã”Ã‡Ã´ Damn the Land Ã”Ã‡Ã´ Seas - Oceans. It is a matter of fact that the dams and barrages were constructed to harness hydroelectricity and to irrigate the land. The benefits were realized in no time and soon enough electricity was available in the remotest villages while the land in the irrigation canal command area was able to produce at least 3 times as much. The benefit was at the cost of the forested area that had to be cleared; the land area that was submerged and the Project Affected Persons who were forced to abandon their hearth and home. The dams when commissioned had to face the problem of silting up and only after a few years their capacity was invariably reduced by one third. The silt having been retained at the dam sites was not available downstream, and thus the water made available for irrigation did not have the nutrients available earlier. No wonder the high dams are not being favoured in the countries which introduced them. The irrigation system has likewise had its days and has in most cases outlived its age. The valuable land has lost its productivity while only halfway through i.e. in about 7 to 10 years since signs of salinization and waterlogging due to seepage started appearing in just as much time. The land was salinized by the accumulation of salts brought by the rivers. Diversion of river water into the irrigation fields deprived the rivers of freshwater in the delta areas. Freshwater stopped flowing for almost ten months in the downstream areas, while seepage from the unlined canals and irrigated land accumulated and waterlogged the adjacent land. The lower deltaic plain in the area lying in the deltaic floodplain being no longer an active flood plain was subjected to extensive erosive action of the seawaves particularly during stormy conditions. This has led to submergence of a number of islands. The erosive action of flood flow over the dry river bed of the rivers e.g. the Indus and of flash floods over other rivers in Sindh West viz. the Ren Pethani, Lyari, Malir, and Hub has exposed the river bed of the concerned rivers to the rock bottom. The rock bottom in the case of River Indus is only 3 meter above sea level at Kotri Railway Bridge about 170 km from the sea coast, and is now exposed to intrusion of seawater during high tides. Flooding in the lower deltaic plain used to restrain the seawater salinity from intruding into the mainland, but flooding has ceased to occur and hence the potential gradient is reduced to the extent that seepage potential has overwhelmed the streamflow. The canal command boundary has, during the course of time, become wet with seawater reaching upland during high tides. The ecology of the entire Indus Basin has changed as a consequence of diversion and distribution of the water resources thinly over accessible and inaccessible areas of the country. This has, among other adverse impacts, steadily reduced the stream flow and the sediment load carried by it after the inception of Kotri Barrage in 1956. Thus the irrigation system that benefited the canal commands areas with water and silt as nutrient has, with no water stream in their surrounding, deprived the delta of the water as well as silt. It is known that with a reduced sediment supply but the same flow volume, the estuary of the river is degraded. On the other hand the same sediment load with a reduced flow volume would cause accretion of the river estuarine area. The reduction in flow volume as well as silt has thus progressively and irreversibly degraded the Indus Delta. The steady reduction in silt load led the erosion processes to dominate over the process of sedimentation/deposition. Commissioning of the Kotri Barrage in 1956 effectively altered the salt balance in the CCA and in relocating the moderately salt affected areas in the old channels or deep cover floodplains which receive substantial quantities of water for leaching out the salts. It is now reported and also apparent from the surveys that 67% of the Kotri Command area is moderately salt affected while 33% is severely salt affectâ”¬Â¼ed. The high salinity area is continuing to move towards the command boundary under the potential gradient of seepage, and as mentioned above, it is keeping the soil moist. This condition is entirely different from the past when floods would wash off the salts from the land surface which would dry up with their recession. Ecological imbalances due to salinity or alteration of salt balance have occurred in majority area of Sindh to the extent of altering the chemistry of the irrigated land. Out of the total 5.35 MHa canal command area 1.35 MHa within the CCA, is salt affected, while 1.02 MHa has been affected outside the CCA. 16% of the land area in Sindh is saline, 2% sodic, 6% non-gypsifâ”¬Â¼erous, 44% gypsiferous while 31% is non-saline. The conditions just stated are ideal for restraining the availability of trace elements. It may be stated at the outset that alteration of salt balance towards alkalinity reduces the productivity of the soil while reduced availability of essential trace elements is detrimental to growth. In the absence of amendments to rectify the salinity/alkalinity, the soil would lose productivity and yield of crops would be lower than normal. The end result would be complete loss of land and ruination over irrigated land. This ground reality is demonstrated by the loss of 16% of the land area in Sindh to salinity, 2% to sodic alkalinity, 6% rendered non-gypsifâ”¬Â¼erous, and thus leaving only 31% as non-saline. The above is only a reflection of a study carried out to quantify the above thesis that the irrigation system, has during the process of aging, seriously degraded the ecology of the land. The reduced flow or no flow downstream has caused the death of the Indus delta. But this is not all; the New Theory on Climate Change, reported in http://www.downtoearth.org.in/comment/reply/38648/6190, further elaborated in http://www.downtoearth.org.in/comment/reply/38648/6454, has attempted to show that no flow has increased the salinity of the sea all along the coastal zone. The hypersalinity is responsible for lowering the specific heat capacity of seawater from 4.186 to 3.88; the difference though slight suggests that the seawater in the coastal zone will vaporize faster than at the open seas. The high temperatures of the heat zone that is now spread over the arid zone of Balochistan-Sindh-Southern Punjab (that drives the monsoon engine) is considered sufficient to raise the temperature of the Arabian Sea by 1oC to 1.5oC as also reported by the IMO. The ultimate result of degradation caused by anthropogenic activity, in this case by the irrigation network and rampant deforestation, is that there will be more vapour over the seas and hence in the troposphere, which when saturated by excessive water vapour will induce heavy precipitation in the form of excessive rainfall and snowfall. Construction of dams over the Himalayas will end up in substantial reduction in forest area. According to estimates by Conservation Biology in December 2012, 90 per cent of valleys and 25 per cent of dense forests in the Indian Himalayas would be affected, while over 54,117 hectares of forests would get submerged, and 114,361 hectares would be damaged by dam-related activities, totaling about 170,000 hectares. It may be too early to say and perhaps also absurd to suggest, but the ground reality indicates that in the long run it may induce desertification over the higher latitudes as well. Environmental and social impact of hundreds of dams and the irrigation network of several thousand km of canals would be enormous as correctly judged the coordinator of South Asia Network on Dams, Rivers & People. He is right when he says that corruption is behind this dam-building spree, which has caught the fancy of politicians, contractors and bureaucrats. Less destructive alternatives are not even considered. I would suggest that instead of rapid growth of economy, it would be much better to adopt a sustainable rate and plan not to impoverish the resources in one go. In the early 1970's with reference to a query from Parliament--whether deforestation affecting Simla rainfall? ;[whether the onset of Monsoon date over Delhi is correct?] --IMD, Pune scientists under the guidance of (late)K N Rao--who was a co-author of "Climate Change" manual published by WMO/UN in 1966 -- studied and published the same. They found there is a reduction in rainfall with deforestation in Simla forests. Also, ecological changes -- changes in land use and land cover -- impact meteorological parameters of the region. They are all direct impacts. Also, we can expect indirect impacts too. There is a need to study such issues in wider perspective rather than on dams alone. Pilgrimage, sports, human settlements, etc along with changes in agriculture scenario do play major role. All big projects planned and executed by the government are not for the benefit of the people. It is for the benefit of the few politicians and their cronies. For example, the Sethusamudram project will generate perpetual work dredging which will benefit the politicians through the Benami contractors in addition to the kickbacks generated during the construction of the project. The observation by Dr. Reddy: Ã”Ã‡Â£there is a reduction in rainfall with deforestation in Simla forests. Also, ecological changes -- changes in land use and land cover -- impact meteorological parameters of the region. They are all direct impacts. Also, we can expect indirect impacts too. There is a need to study such issues in wider perspective rather than on dams alone. Pilgrimage, sports, human settlements, etc along with changes in agriculture scenario do play major roleÃ”Ã‡Ã˜ again supports my thesis that human impact on precipitation is associated both with 1) global warming resulting from anthropogenic greenhouse gases that necessarily includes water vapour; and 2) ecological changes brought about by excessive deforestation that has caused expansion of the heat zone that drives the monsoon engine. The direct and indirect impacts, I reiterate, are all human interventions that are the cause and effect of both global warming and ecological changes. By reducing the flow downstream, those in Governing Hierarchy, have caused the death of the Indus delta. But this is not all; the New Theory on Climate Change has shown that no flow has increased the salinity of the sea all along the coastal zone. The hypersalinity is responsible for lowering the specific heat capacity of seawater from 4.186 to 3.88; the difference though slight suggests that the seawater in the coastal zone will vaporize faster than at the open seas. The high temperatures of the heat zone that is now spread over the arid zone of Balochistan-Sindh-Southern Punjab (that drives the monsoon engine) is considered sufficient to raise the temperature of the Arabian Sea by 1oC to 1.5oC as also reported by the IMD. The ultimate result of degradation caused by anthropogenic activity, in this case by the irrigation network and rampant deforestation, is that there will be more vapour over the seas and hence in the troposphere, which when saturated by excessive water vapour will induce heavy precipitation in the form of excessive rainfall and snowfall. The impact of excessive vapour is cause for the abnormalities observed as heavy rainfall and equally heavy snowfall. Construction of dams over the Himalayas has already resulted in deforestation of the Himalayas and substantial reduction in its forest cover. According to Dr. Reddy, the IMD had in the 1970s, indicated that there would be reduction in rainfall with deforestation in Simla forest area of the Himalayas. According to estimates by Conservation Biology in December 2012, 90 per cent of valleys and 25 per cent of dense forests in the Indian Himalayas would be affected, while over 54,117 hectares of forests would get submerged, and 114,361 hectares would be damaged by dam-related activities, totaling about 170,000 hectares. It may be too early to say and may sound absurd, but the above observation indicates that in the not too distant future the process of desertification due to deforestation will engulf the higher altitudes of the mountains as well. What have you pointed here regarding the impact of dams on the Himalayas is a fact that displays the hidden danger behind these projects. You can favor the establishment of dams to overcome the power shortage, however, it is also true that it affects the biodiversity of the region that can cause serious consequences. So a research have to be conducted prior to the set up of dams.